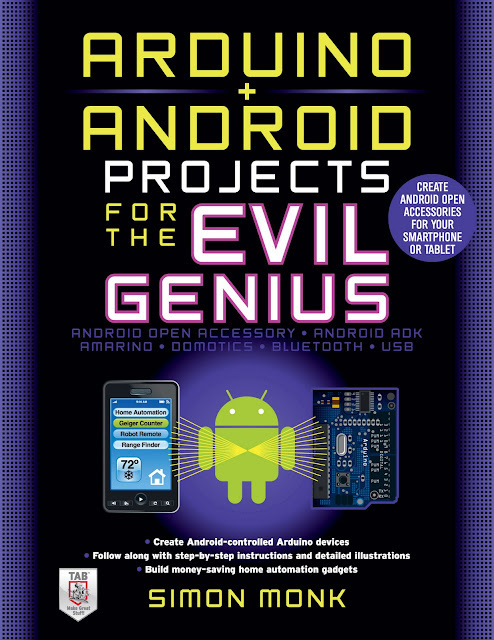 My new book 'Arduino + Android Projects for the Evil Genius' is now available for pre-order from Amazon. See the link to Amazon in the right-hand panel (scroll down a bit). 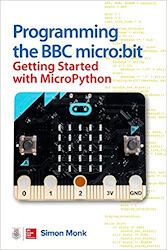 The cover on Amazon hasn't been updated yet, so it looks a little different. The first books should be shipped around the start of December. Control a small rover from your Android Phone using Bluetooth and an Arduino and Motor shield. An Android Open Accessory Project using a USB host shield and Arduino Uno. A powered Open Accessory dock for your Android phone that drives three LED panels to make a sound sensitive light show. Programmable Infrared remote control accessory for your Android phone. A temperature logger that uses the Android phone to wirelessly send readings to Pachube. An Android Open Accessory for measuring distance. The Android tablet base unit with a audio jack interface to Arduino. Add control of AC outlets and lights to the Home Automation Controller from Chapter 7. Add control of domestic heating to the Home Automation Controller using low cost RF data modules. Network control of two flags that can be activated from any Internet device. Useful for the Evil Genius to summon minions. A simple to make Arduino-based delay timer.